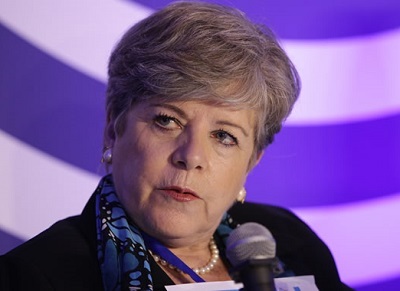 NEW YORK, July 13, CMC – The Executive Secretary of the United Nations Economic Commission for Latin America and the Caribbean (ECLAC), Alicia Bárcena, says planning is key to the implementation of the United Nations 2030 Agenda in the region. The senior United Nations official participated in the “Policy Coherence: From the Global to the National and Local Levels,” organized by ECLAC and the government of Guatemala, and held on the sidelines of the High-level Political Forum on Sustainable Development, which is taking place through July 18 at the United Nations’ headquarters. “The 2030 Agenda calls on us to change our fragmented and isolated institutional culture in order to act in a coordinated, articulated and inclusive way, with multi-sectoral approaches and by identifying the interconnections and critical links between the economic, social and environmental dimensions of sustainable development,” said Bárcena in her remarks. “Long-term planning allows for producing state policy and building the continuity of development models, with greater equality and sustainability at a national and territorial level,” she added. Bárcena noted that public policy is effective when it is “territorialized” and has budgetary backing, adding that planning guarantees coherence among public policies. In this regard, Bárcena called for bolstering the Statistical Conference of the Americas (SCA)as a regional platform for data and statistics related to sustainable development. ECLAC’s top representative said that, to date, only on five of the 17 UN Sustainable Development Goals (SDGs) have a chance of reaching 50 per cent of their indicators. These include SDG 1, on ending poverty; goal 3, which refers to health and well-being; goal 5, on gender equality; goal 7,which calls for guaranteeing access to affordable and clean energy; and goal 8,which addresses decent work and economic growth. She said that, currently, 20 of the 33countries in Latin America and the Caribbean have national coordination mechanisms for the implementation and follow-up of the 2030 UN Agenda on a national level. Bárcena also noted that more than 50 per cent of the technical secretariats of these mechanisms are planning bodies, adding that “they have the great challenge of coordinating sectors, bringing together actors, defining the strategies and alliances needed to achieve the SDGs, and preparing for accountability processes. ECLAC presented a methodology for identifying the critical links and nodes between the 2030 Agenda and planning. Bárcena said the methodology allows for aligning national priorities with global ones. It also aims to “identify the links between these targets and strategies in order to subsequently carry out a process of prioritization through the identification of critical links and nodes, which ultimately develops into propositions for national priorities regarding the process of implementing actions toward achieving the SDGs,” Bárcena said. Additionally, she highlighted the importance of the Regional Council for Planning, the intergovernmental subsidiary body that orients the activities of ECLAC’s Latin American and Caribbean Institute for Economic and Social Planning (ILPES). Bárcena pointed to the relevance of the Regional Observatory on Planning, a space for analysis, information and the collective construction of knowledge for governments, academia, the private sector and civil society, with regard to planning for development in Latin America and the Caribbean. In addition, she reiterated the key role played by the Forum of the Countries of Latin America and the Caribbean on Sustainable Development, an annual meeting organized under ECLAC’s auspices, which constitutes a multi-actor platform for fostering dialogue among peers, learning and the exchanging of experiences at a national and territorial level regarding implementation and follow-up of the 2030 UN Agenda for Sustainable Development. Bárcena noted the Forum’s successful second meeting, which was held in April 2018 at ECLAC’s central headquarters in Santiago, Chile, where ECLAC presented the Second annual report on regional progress and challenges in relation to the 2030 Agenda for Sustainable Development in Latin America and the Caribbean. This Forum will hold its third annual meeting on April 22-26, 2019 at ECLAC’s headquarters in Santiago, Chile.